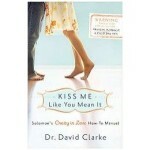 As a marriage counsellor of over 20 years, Dr David Clarke has written a wickedly funny but incredibly insightful book: Kiss Me Like You Mean It! It turns out, that he has a very simple test for determining whether or not the couple before him in a counselling session have any passion in their marriage. It’s whether they kiss passionately on a regular basis or not. There are some “kisses” (he points out) that couples think passes for a kiss, that aren’t really a kiss at all. Like the perfunctory peck on the cheek as they part ways at the beginning of the day when one or both of them head off to work. Peck. The sort of kiss you’d give your aunty or uncle. Dry. Measured. Appropriate? Yes. Passionate? No. Reflective of a deep yearning and love for one another? No. Then there’s the kiss where you kind of reach out with your lips – standing a foot or two apart, trying not to touch. That one fails the test too. Of course there’s the sound effects only kiss – you know when you’re standing 10 or 15 feet apart, and instead of heading towards each other, you kind of blow one another a kiss. Is that a kiss? Nope. It’s a sound effect!! And Clarke argues that if a couple engages mostly in that sort of passionless kissing in their marriage, well that’s a clear indicator that the spark has gone out of the relationship. That’s not to say that they don’t want a passionate marriage. She loves romantic books and movies, wishing that her man could be like the heroes in these fiction stories. He, sadly, ogles at other women – because that’s how he functions. Both of these behaviours represent the same thing: a deep, unfulfilled yearning for passion and intimacy. It’s tragic!! They want a passionate marriage both of them. They really, really do … but it’s been so long that they just don’t know where to start. So let’s start with some wisdom from the Bible. God’s living Word. Because He’s dedicated a whole book of the Bible – the Song of Songs in the Old Testament – to the passionate love between a man and a woman. And what that tells me is that this passion thing is really, really important in God’s eyes (which is maybe why husbands and wives around the globe, made as they are in God’s image, yearn for that kind of passion in their marriages too). What’s God saying? If you want that spark back in your marriage, you need to kiss your wife or husband like you mean it. Just stop and think about that. What if you, when you parted tomorrow morning – heading off to do what ever it is each of you do during the day, work, rearing children, whatever – what if you kissed your marriage partner not with the peck that you normally do, but you kissed them like you really mean it? What if you just started with that? Husbands in particular. What if once or twice a day – every single day from now until the end of your life – you held your wife in your arms and hugged her and kissed her like you really meant it? Do you think that would make a difference in your marriage? You bet it would!! This one thing – kissing your beloved like you really mean it – can be the beginning of an amazing turnaround in your marriage. Really. The Song of Songs which, let me remind you, is in the Bible, talks explicitly about the sexual intimacy between Solomon and the Shulamith woman. It blows me away that God would put this in His Word – a whole book! But He has and the reason He has is because: husbands and wives, He made you to love one another passionately. He didn’t make you to argue and pick at one another. He didn’t make you just to peck one another on the cheek. No!! He made you to love one another passionately, at every level. Sometimes our hearts grow cold in marriage and we need a heart starter. A kick start. A spark to get the fires burning again. Well let me tell you – this is it. Husbands, kiss your wives, wives, kiss your husbands like you really, really mean it. yes ,,all that you have written is true ..but there are people who never had any passion in their married lives ,what should they do , who have never even kissed passionately but still dragging their married lives just for the sake of their kids. I received this devotional from Bayless Conley just today. Very good! It grieves my heart, as I look across the country, at the number of Christian marriages being destroyed by adultery. It should not be that way! Now concerning the things of which you wrote to me: It is good for a man not to touch a woman. Nevertheless, because of sexual immorality, let each man have his own wife, and let each woman have her own husband. Let the husband render to his wife the affection due her, and likewise also the wife to her husband. The wife does not have authority over her own body, but the husband does. And likewise the husband does not have authority over his own body, but the wife does. Do not deprive one another except with consent for a time, that you may give yourselves to fasting and prayer; and come together again so that Satan does not tempt you because of your lack of self-control. Now, if these verses are saying anything, they are telling us that married couples should enjoy sexual intimacy. In fact, the more they enjoy it, the better safeguard it is against immorality. Notice Paul even goes so far as to say the wife does not have authority over her own body; and the husband does not have authority over his body. As husband and wife, you belong to one another. It says do not deprive one another unless you are going to be fasting and praying, and then only with consent. I want to challenge you to make sexual intimacy a priority in your marriage. Don’t consider it as unimportant, or leave it to your spouse. Take the responsibility to light the fire of sexual intimacy, and close the door to Satan’s temptation.